Oskarmandude has contributed to 664 posts out of 468653 total posts (.14%) in 2,232 days (.30 posts per day). are you on version 1.10? wow i can't believe no one has done this before!!! I personally disagree with the Alt-Right but no one deserves cancer for having the wrong opinion. And I could just say "Lol who defends someone that tells people they should get cancer and give their family a financially crippling health care bill"
of course you couldn't be more wrong. There was no disagreement, it was in response to an alt right white supremacist troll. Why don't you post the full context of that? Quote: 19/m/white, Alt-Right for life, Trump Supporter, Devils Advocate, owner of unpopular opinions, known for triggering liberal dumbasses, Xbox GT: Halo Archivist. oh no, not the alt right white supremacist trolls! the guys in charlottesville are dangerous, sure, but not this dude crapposting on twitter whose profile picture is a bloody meme. and nothing about the context you gave even suggested that he's a white supremacist, you're just making crap up. idk if it's to make yourself seem like less of a bad guy for the disgusting tweet you made, which didn't come to fruition btw if that was the intended effect. -"Alt-Right" is a really vague term because it literally just means right wingers who oppose the right-wing establishment. If this is why he deserves cancer, then you're just an elitist of establishment politics. But I know that's not the definition of Alt-Right you're using, you're using the umbrella term for young conservatives who have a hard line traditional stance on social values and are opposed to demographic replacement. If these are your reasons, I'm letting you know that having the "wrong opinion" is not a reason for someone to deserve cancer. -62,984,825 people voted for Trump, and there are many additional Trump supporters abroad. This is a huge death toll that would have catastrophic effects on the world. Again, having the "wrong opinion" is not a reason for someone to deserve cancer. 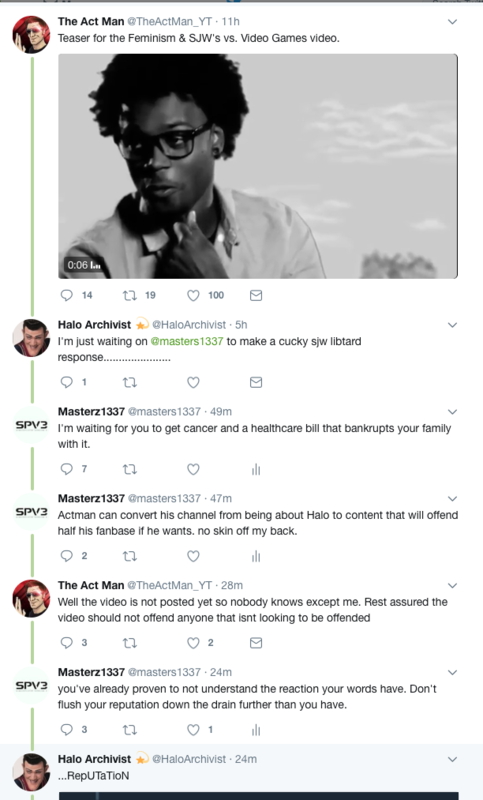 -Maybe Masterz really hates devil's advocates, idk. I don't know why anyone would hate them, and I know this isn't Masterz' reason for thinking that this guy should get cancer, but I'm still writing this short paragraph to say that it is yet another attribute that is not a reason for someone to deserve cancer. -If this is your reason for thinking he deserves cancer then you're actually a psycopath. Not being the lowest common denominator isn't a sin. -Is this really a reason for someone to deserve cancer? Dumbarses will get triggered either way, this kid is just an agent of everyone else's (not Masterz') entertainment. Or does Masterz not like that liberal dumbarses are the dumbarses that this kid triggers? Well, again, having "the wrong opinion" is not a reason for someone to deserve death, Big Brother. I know it's not a good GT, but come on. "you've already proven to not understand the reaction your words have. Don't flush your reputation down the drain further than you have." Haha, Masterz, what is wrong with you? who spilt the vaseline on the spartan biped? Time: Thu April 25, 2019 3:02 AM 203 ms.